Google has announced that the Google My Business Agency Dashboard is launching this week. They had previously announced that the feature was coming a month ago and they've finally delivered. So what's all the fuss about? All registered agencies can now manage thousands of locations within a single Organization Account with fast performance—you’re no longer limited to 100 locations per account. The new Agency Dashboard makes sending and receiving invitations to manage Google listings easier. You can view the status of all of these requests right from the agency dashboard. User Groups enable agencies to effectively manage teams and control access to their location groups. The Agency Dashboard lets you efficiently search for locations within your entire account or within a particular Location Group. Google My Business now allows agencies to register directly with Google and receive exclusive benefits. Registered agencies can enjoy more robust account management options and Google support that’s tailored to their needs. 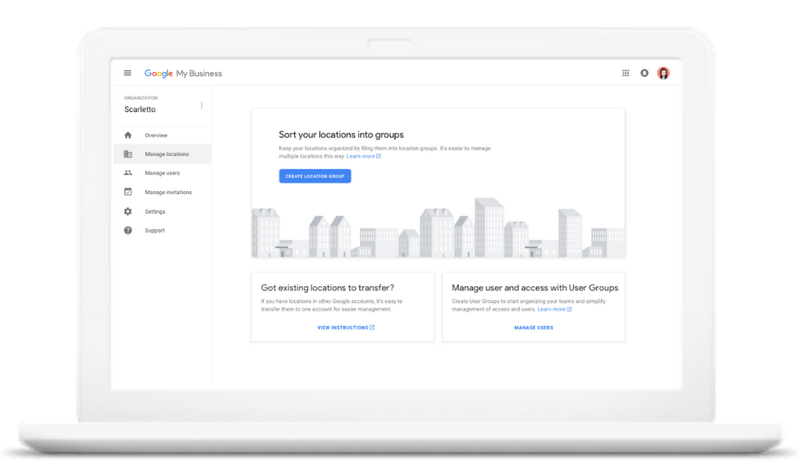 Register your agency on Google My Business using a Google account that doesn't contain any locations or location groups. Create a location group to start managing locations. You can create more than one location group. Location groups: Have the customer invite your organization using the organization ID. Create user groups to give people in your organisation access to specific location groups. Invite users to join your new user groups. Note: Users can only join a user group if they don't have any locations or location groups in their account. If there are locations in their account, users will need to remove access to any locations and location groups before accepting the invite. If you already manage locations and locations under other Google accounts, migrate them to your organisation account. If you're not familiar with Google My Business, then allow me to give you the grand tour. GMB is a free and easy-to-use tool for businesses and organizations to manage their online presence across Google, including Search and Maps. All you have to do is submit your listing to Google, and once it's verified, it will be displayed in Google Search for brand terms and certain location-based queries. GMB also allows you to make live edits your business information and can help customers find you and keep them informed. GMB lets you easily manage the information that Google users see when they search for your business or the products and services that you offer. Google has stated that businesses that verify their information with Google My Business are twice as likely to be considered reputable by consumers. When people find your business on Google Maps and Search, make sure that they have access to information like your hours, website, and street address. GMB also allows customers to provide feedback and have their say on interactions with you're business. Read and respond to reviews from your customers, and post photos that show off what you do. Google says that companies that add pictures to their listings receive 42% more requests for driving directions on Google Maps and 35% more clicks through to their websites than companies that don’t. See insights on how customers searched for your business, and where those customers are coming from. You can also see information like how many people called your company directly from the phone number displayed on local search results in Search and Maps. If you are an agency that manages multiple businesses listings or you're the marketing team for a multi-national or international franchise you can now rejoice in the fact that those manual updates of one account at a time are a thing of the past.